I read this at the beginning of 10 days of prayer and fasting and it immediately spoke to me about how to approach those 10 days. I am not a woman so I cannot comprehend the emotion she was feeling as a result of being unable to have a child. However, I can understand barrenness. I can understand what it is like to have a deep desire for something significant to happen and for it to not be, while around me others are quite obviously living a fruitful life. Hannah would not allow barrenness to define her. Instead she kept believing and trusting in God. It’s too easy to think how things are is how things will always be. With God, things always have the potential for change. Hannah poured out her heart to God. Sometimes it is not about the words we could say, but the cry of our heart before God. He hears the deepest of sighs, the longings we have which are caught in the depths of our souls. Hannah was misunderstood. In pouring out her heart in such a way, comment was made. Doesn’t that happen? The emotion of all which is going on, can cause others to wonder why you are behaving the way you are. Why fast for 10 days? Why pray with such purpose for 10 days? Hannah shared from a place of complaint and grief. We might know we are positioned in a place of victory, yet life may not always feel victorious. Be encouraged that it is alright to allow God to hear you, hear your complaint, to understand your grief. Hannah left it all with God. 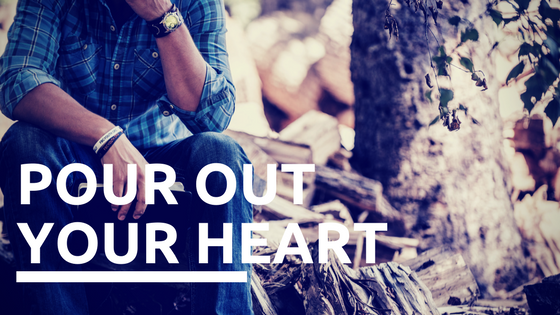 Allow your heart to be heard by God. Allow those longings which come from a place of complaint and grief to make their way in to God’s presence and then leave them there. Hannah sees something new birthed in her live. Within the year, a son is born. A gift from God, birthed from pouring out her heart to her God. And she immediately give what has been birthed by the power of God, back to God. I poured out my heart to God. I spoke some words, but more importantly from the quietness of my heart, I allowed my complaints and my griefs to shout out to my God. After all, I want to hear from Him, I want to be moved by Him, I want to see some change and some direction. I want some fresh revelation for myself, my family, for my future and for my Church too. I am choosing to leave them in His hands. Just as Hannah said ‘I have spoken until now’, so have I. Now I am trusting God to birth something new, to bring something new to life, something which will grow to honour Him.